I was born in Cardiff and have retained a deep love for my Welsh roots. I worked as a nursery teacher in London and later taught Deaf children in Croydon and Hastings. I now live on the beautiful Isle of Wight with my husband, where I walk my cocker spaniel Pepper and write. I have two grown up children. 'Free to Be Tegan' was my debut novel. It is to be the first of a series of novels set in Wales. The second will be set on the spectacular Gower Peninsula. 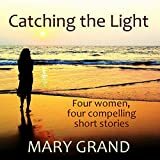 I have also published a short book of short stories 'Catching the Light'.